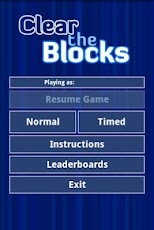 Clear the Blocks for Android is a challenging puzzle game where players must clear away the blocks in an intelligent and clever manner. Greater efficiency brings about a greater reward. There are two different game modes, normal and timed. For new players, the normal game mode offers a great way to test the waters and get familiar with some basic strategy. After mastering the normal mode, players should check out the timed mode and see how many points they can rack up before the timer runs out. New puzzles are randomly generated each time, so there's a lot of content packed into Clear the Blocks. Speaking of content, this game also brings a social experience through its implementation of global Android leaderboards and achievements powered by Swarm. 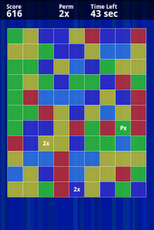 If you're into puzzlers, take a peek at the screenshots below and then go download the free Clear the Blocks Android game!